In a feisty speech, Obama pitched a patriotic, quasi-populist, OWSish progressivism to set up his 2012 reelection campaign. Pete Souza/The White House/ZumaJump to all the best tweets of the debate, as it unfolded in real-time, by the MoJo news team and other political junkies. A year ago, President Barack Obama, in his second State of the Union address, spoke in lofty terms about how to “win the future.” Tonight, his third annual report to Congress was more about winning the next nine months. That’s how much time Obama has left to persuade voters that his vision for the coming years is better than that of the Republicans—and that he has a way to get there. 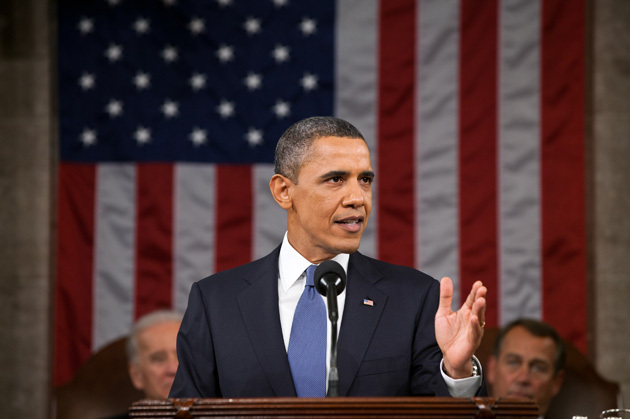 The president was assertive in challenging the Republicans, without being combative. He didn’t yield an inch on his core initiatives—defending health care reform and doubling-down on supporting clean energy programs. This speech reflected his strategists’ belief that he can juice up both his progressive base and independent voters by fighting for centrist programs (or what used to be centrist programs) with a progressive bent. In the past year, Obama has moved from a compromiser-in-chief looking to cut deals with the Republicans (to avoid such negative consequences as the end of the Bush tax cuts for middle-income earners, a government shutdown, and a default of on US government debt) to a semipopulist battler for the middle class who is eager to defy Republicans over issues of economic fairness and the role of government. Once the president was free of the debt ceiling tar pit—and the Republicans were no longer holding the economy hostage—he launched a campaign for a jobs bill that emphasized confrontation, not negotiation. He and his aides had concluded that few, if any, worthwhile deals could be reached with House Speaker John Boehner, who was essentially held captive by the tea party wing of his party. Consequently, Obama could leave behind the failed attempt to reach a grand bargain on deficit reduction and initiate a grand debate over national values. Due to this shift, the 2012 race is shaping up as a titanic face-off between a president who advocates using government to bolster the economy and address inequities and Republicans who have one answer to everything: Smother government and let the markets run free. In his speech, Obama called for “great projects.” Republicans call for no projects—that is, nothing outside the private sector. This is a damn clear contrast. Compared to GOP Indiana Gov. Mitch Daniels’ less-than-inspiring rebuttal, Obama was full of vigor and vision. Daniels hit all the Republican talking points: class warfare, freedom, markets, and lightbulbs. (You had to be there.) But it was a flat same-old, same-old response that seemed cast for committed Republican, not independent voters. His was a dour message—freedom is under assault. Obama aims to rouse. One of my proudest possessions is the flag that the SEAL Team took with them on the mission to get bin Laden. On it are each of their names. Some may be Democrats. Some may be Republicans. But that doesn’t matter. Just like it didn’t matter that day in the Situation Room, when I sat next to Bob Gates, a man who was George Bush’s defense secretary, and Hillary Clinton, a woman who ran against me for president. All that mattered that day was the mission. No one thought about politics. No one thought about themselves. One of the young men involved in the raid later told me that he didn’t deserve credit for the mission. It only succeeded, he said, because every single member of that unit did their job—the pilot who landed the helicopter that spun out of control; the translator who kept others from entering the compound; the troops who separated the women and children from the fight; the SEALs who charged up the stairs. More than that, the mission only succeeded because every member of that unit trusted each other—because you can’t charge up those stairs, into darkness and danger, unless you know that there’s someone behind you, watching your back. And that is why the nation must decide to use its collective wealth (via taxation) to work together (via prudent and fiscally responsible government programs that invest in the future and protect the citizenry) for the betterment of the entire nation. Obama is pitching a patriotic, quasi-populist progressivism (while conceding the need for deficit reduction and government cost efficiencies). Before he can win the future, he’s going to have to sell this message. And this speech was an effective kickoff for that campaign. And that’s the speech. One hour and five minutes long. Assertive but not angry. OH BY THE WAY I KILLED OSAMA BIN LADEN. “Send me a bill” is the presidential equivalent of “one more time and you get a time out.” And just as effective. Kinda surprised Obama didn’t name-check Romney with thanks for the health care idea. We’ve reached the Elizabeth Warren portion of the speech. Obama: “You can call it class warfare all you want.” GOP: Challenge accepted. Sorry, but taxes are going to have to go up on those making under $250K. It’s just math. Exactly my thought. RT @dan_munz: This means it will poll incredibly well. RT @kdrum: This is a remarkably content-free speech. When Obama talks about a fee on the largest financial institutions, Geithner winces deeply, looks constipated. Sort of amusing watching Boehner’s painfully reluctant applause. Pay attention to that basic minimum tax proposal for multinationals. That’s a big deal. I wonder if Obama read the NYT’s piece on the iphone. He sounds a bit overly optimistic about American manufacturing. Sorry, once you start watching Joe Biden at one of these things, it’s really hard to stop. Biden just had an Altoid. The #SOTU in short: I ended a war. I killed bin Laden. No wimp here. I”m going to tweet this piece, by @mattglassman312, again: j.mp/xpsVJB The State of the Union is great, ignore the haters. Inviting Warren Buffet’s secretary–who famously pays higher tax rate than boss–to SOTU = genius. BREAKING: Tom Vilsack is Secretary of Agriculture. Interested to see if Obama will own recent #Iran sanctions legislation. Remember, WH was not happy when it was proposed. Chart: Is Obama Really the “Food Stamp” President? “I Am Obamacare”: A Meme is Born?